Housed in open-frame, IC brick style packages, Triton “Socket Servo” drives are fully programmable motion controllers and offer a wide output power range from 1 amp continuous to 8.5 amps peak current and to 9 V to 48 V. Triton is an ultra-compact solution, measuring 43mmx 45mm, providing top performance, advanced networking and built-in safety, as well as a fully featured motion controller. 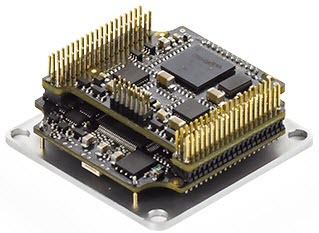 It can control multiple motor types and supports almost any feedback sensor including absolute serial encoders. Triton “Socket Servo” IC brick drives come in 1 amp, 4 amp and 7 amp continuous current ratings and are capable of providing the nominal current from -25 ºC to 85 ºC (temperature measured in the cold plate) with a 1.2 ºC/W heatsink attached by means of a low thermal resistance interface material. 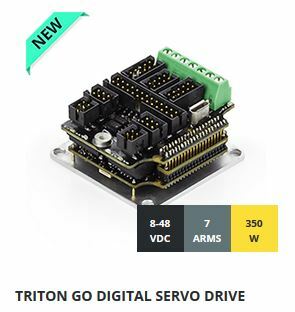 Triton “Socket Servo” drives offer 96% at the rated power and current. The Triton “Socket Servo” series IC open brick drives may be controlled by USB, CANOpen, EtherCAT, RS485 full-duplex (compatible with RS-422), embedded EEPROM memory using macro programs, PWM, step & direction, digital I/O or analog signals of 0-5V or +/- 10 V signals. 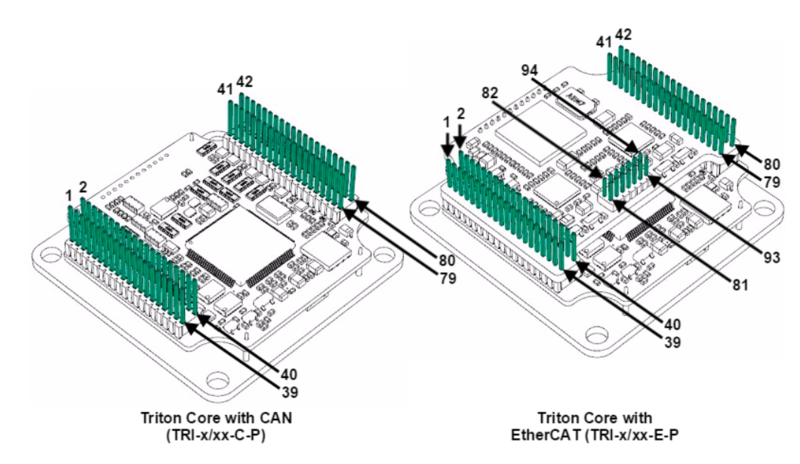 Triton “Socket Servo” drives software is either by the MCLIB is C++ library designed to be compatible with Windows and Unix systems. This allows you to create applications for mobile systems like iOS or a small master controller with Raspberry, or with the MOTIONLAB user programming interface. All MCLIB software has been written so that anyone with no experience on servo drives, registers and motion control could find a solution for their application. This translates into class functions like enableMotor() or set Position(1200). Libraries are available for Arduino and Raspberry Pi CPU's. Triton “Socket Servo” IC brick drives are the “drive of choice” for low inductance motors. The standard 20 KHz PWM switching frequency can be change to the optional 80 KHz PWM frequency by updating a single register.